Welcome to the House by the Mouse, Kissimmee, Florida! The community is only 3.5 miles from the entrance gates to Walt Disney World where you can visit the Magic Kingdom, EPCOT, MGM Studios, Animal Kingdom, Typhoon Lagoon, Blizzard Beach and many other Disney attractions. Universal Studios and Sea World are a short 15 minute drive away. The Gulf Coast beaches can be reached in just over an hour. There is a Shuttle Service to area attractions for a small fee. On entering the resort complex, all guests are greeted by the splendid Gatehouse offering 24-hour security. Central to the resort is the Clubhouse with a luxurious lounge, games room with pool tables, table tennis and a video games arcade. Business facilities with internet access are also available. The large community swimming pool offers a place for relaxation, a children's area and spa. The convenience store by the pool is an ideal place for purchasing snacks and refreshments. You can also purchase tickets for the shuttle bus to the attractions. The resort has its own fully equipped gym with changing room and shower facilities. For the energetic guest, the resort offers two tennis courts, a sanded volleyball court and basketball court. Families can spend time together or socialising with other guests in the resort picnic and barbecue area. For younger guests, there is a children's play area available. The resort also has its very own exclusive 58-seat movie theater -- schedule your very own movie screening! 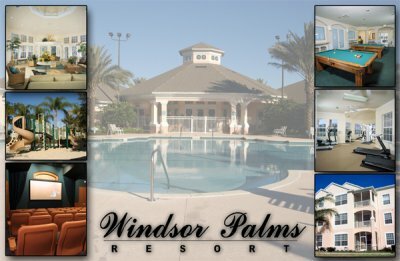 Windsor Palms has its own private facilities which are FREE to resort guests.